@ itsamanda, you are correct, Aquarius and Aries are both Fire sign and compatible. Although they are in compatible signs they are not in trine ( forming an harmonious angle) and many other personal planets are clashing, especially Mercury ( that is governing Communication ) and Mars, ( Action ). It’s more complex than just one Sun sign. @bluwavz wow handsome Dad! 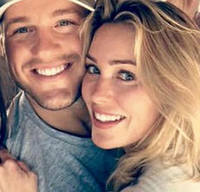 Colton is a good looking guy IMHO. *When you'd hit on the dad over Colton* (I'm 37 so closer to Colton, but his dad is a snack.) Look at me using my young lingo! 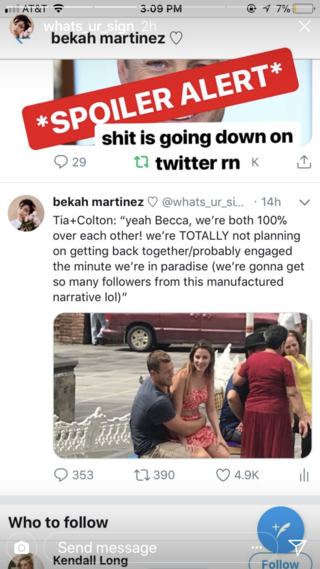 ^Funny reading that when Tia supposedly comes back to tell Becca she still has feelings for Colton. Especially the part about her wanting Becca and Colton to give each other a chance. Colton...boy bye. He knows he's good looking and charming and that these facts buy him more time. More than he actually deserves at this point IMO because nothing about the few scenes that have made it on to my screen has convinced me that he's that interested in Becca tbh. 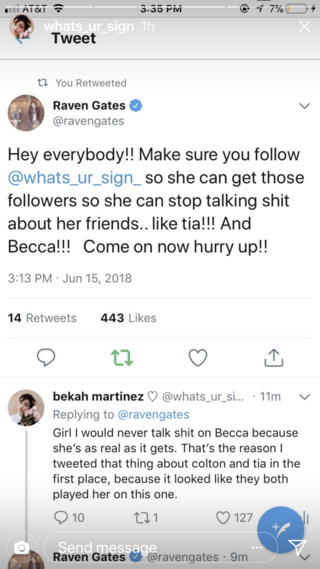 His explanation as to why he and Tia fell through and why he thought he and Becca had a chance sounded rehearsed, frankly politican-like and his recent history with Tia is just another reason Becca should eventually next him. To be fair, I honestly don't think Colton's reasons for coming on the show are much different than a lot of the others guys IMO. Only a few are really ever there for the 'Ette and so because Colton is no different, he should be kicked off just like the rest of them will be. Paradise so she must have the real story. 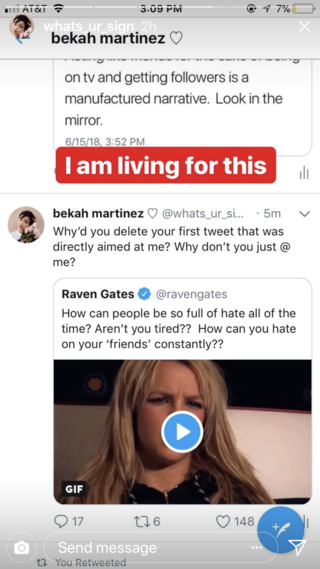 Raven has blocked her.